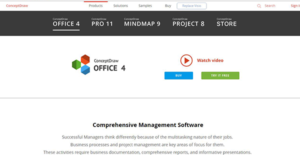 ConceptDraw OFFICE is a comprehensive management software designed by the Ukraine-based company; Computer Systems Odessa, for project managers. It’s a powerful, cross-platform solution that works well on Mac OS and Windows devices to alleviate multiple project management pain points. The platform abridges strategic planning with three well-integrated applications (ConceptDraw PRO, ConceptDraw MINDMAP, and ConceptDraw PROJECT) to facilitate project management and business process. The three components of ConceptDraw OFFICE leverage a cross-platform document exchange technology to allow users to implement a robust visual technique to information management. In addition, the software features a Solution Park which is an impressive online collection of samples, templates, and add-ons that are professionally crafted to solve unique tasks in various business fields. Better still, it comes with a ConceptDraw STORE; a component designed to help users find a solution that satisfies their business needs. The power and suitability of ConceptDraw OFFICE software are drawn from its three integrated components that can function as standalone products. The components are well suited to streamline workflows with a completely refurbished graphical user interface that supports high-resolution displays on Windows and Mac OS devices. The suite simplifies the multitasking of project management and backs all processes with comprehensive reporting, business documentation, and informative presentations. The use of robust document exchange technologies improves workflow and saves time by integrating all facets of the organizational workflow. The technologies amplify the strength of ConceptDraw OFFICE and boost collaboration capability and data presentation to enable you to work smarter with teams, data, resources, and individuals. This delivers a seamless project management experience and makes it easy to track expenses, milestones, and deadlines for your projects. One of its main components is the ConceptDraw MINDMAP. This is the perfect tool for pinpointing and outlining baseline structures. The solution exhibits unprecedented capability and flexibility of working with teams to provide powerful solutions for structure development. It enables you to structure requirements, environment/space, goals/objectives, and time. On the other hand, the ConceptDraw PROJECT allows you to manage objectives/accomplishments, processes/completion, details/dependencies, and structures. It offers the flexibility required to adapt to the environment and provides meaningful data to help project teams to adjust to changes in that environment. Additionally, there is the ConceptDraw PRO designed to help you display process/planning states, results/achievement, and the change over time. The component comes with a plethora of tools that define data promptly in visuals to deliver the meaning of task status thus providing in-depth insights. It eliminates the need for sophisticated tools to pinpoint a specific task status and establish the reason for its failure or success. If you are considering ConceptDraw OFFICE it may also be a good idea to analyze other subcategories of Best Office Software listed in our database of B2B software reviews. Since each organization has specific business requirements, it is advisable for them to refrain from seeking a one-size-fits-all perfect software application. Needless to say, it would be pointless to try to find such a system even among widely used software platforms. The clever thing to do would be to list the various vital elements that need consideration such as required features, budget, skill levels of staff members, company size etc. Then, you should do your research thoroughly. Read some ConceptDraw OFFICE reviews and check out each of the other apps in your shortlist in detail. Such exhaustive research can make certain you reject ill-fitting applications and select the solution that presents all the aspects you require for business success. How Much Does ConceptDraw OFFICE Cost? We realize that when you make a decision to buy Office Software it’s important not only to see how experts evaluate it in their reviews, but also to find out if the real people and companies that buy it are actually satisfied with the product. That’s why we’ve created our behavior-based Customer Satisfaction Algorithm™ that gathers customer reviews, comments and ConceptDraw OFFICE reviews across a wide range of social media sites. The data is then presented in an easy to digest form showing how many people had positive and negative experience with ConceptDraw OFFICE. With that information at hand you should be equipped to make an informed buying decision that you won’t regret. What are ConceptDraw OFFICE pricing details? What integrations are available for ConceptDraw OFFICE? If you need more information about ConceptDraw OFFICE or you simply have a question let us know what you need and we’ll forward your request directly to the vendor.